Hi, my name is Klára. I’m the founder of Prague Extravaganza and I would like to share with you the story of Prague Extravaganza. At first, I thought it will be impossible to squeeze five years of experience, learning and making mistakes into one short blog article. But then I realised that in our free walking tours we present the whole history of Prague in three hours. So here it is – in a few paragraphs! Well, everything started one night in my head in Februrary 2010. I just wanted do my own tours, my own decisions and show my guests Prague on my own way! I also knew I want to give an exceptional service to my guests, work with extraordinary guides who speak excellent English and present the history with an extravagant twist and humour. So the word EXTRAVAGANZA came to my mind. At the beginning I did not want the umbrella, so I came up with the idea of blue balloon. This little piece of plastic became my close friend on my very first tours and it was kind of cute that my guests were looking for a girl with a blue ballon. The negative thing was, my “best friend” was exploding all the time and caused shock to everyone around (including myself). When it rained I had to hold an umbrella in one hand and the balloon in the other one… hmm, not very practical. Eventually, I hand painted Free Tour on the umbrella and said goodbye to my plastic friend. The blue balloon is still living with us actually – it is our logo. Oh man, how nervous I was on the very first day, so I did not show up?! On 7th of July 2010 I was hiding around the corner of meeting point and swearing at myself, how foolish I was to start a new free tour in Prague next to a big international company. The next day I came prepared with a huge dose of courage, a professional guiding license badge and a blue balloon. What a relief when some people arrived and the tour started! At that moment I knew this will work and there will be some travellers who’d like to meet with local guides. Since then we have given hundreds of tours to thousands of people. Join us as a tourist but leave as our friend! Today we are a team of seven guides and manage to give tours all year round, except December 24 – 26 when we are home with our families and January 1st when we are recovering from NYE. 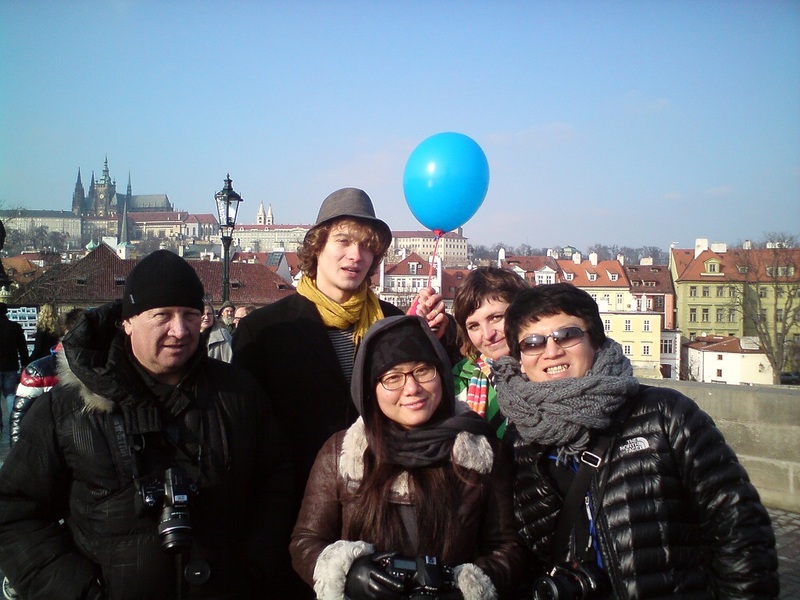 We are like a small family and we have a few things in common – we all like travelling, history, socializing with others, learning new things but most of all we all love Prague and sharing our own admiration with the others! Over those five years, I was very lucky to meet a few exceptional people who helped me to shape Prague Extravaganza into what it is now. … my parents for always being there for me, for their support and inspiration. 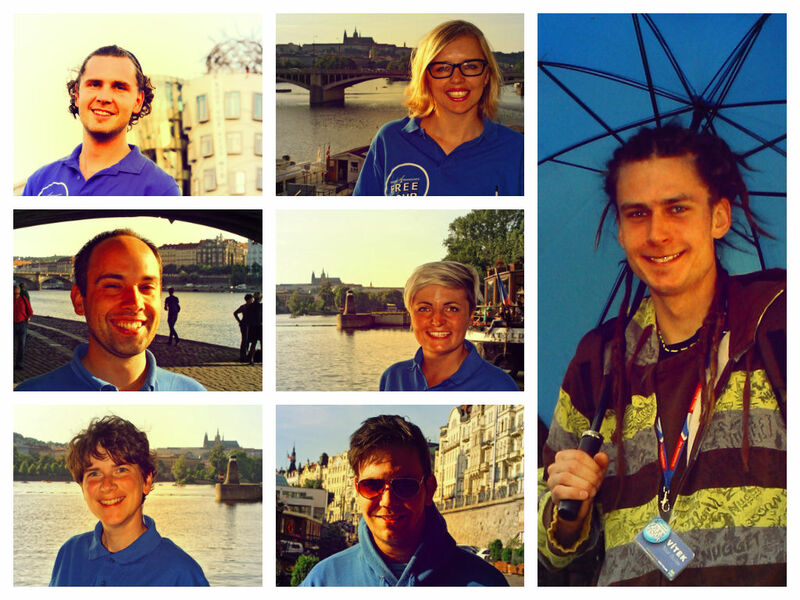 … my colleagues and excellent tour guides Vítek, Zdeněk, David, Venca, Iveta and Tereza for their hard work, enthusiasm and good ideas, they bring into the Prague Extravaganza. … my friend Kamila for helping me with logistics and distribution. … my friend Martina for her creative ideas and constructive criticism. … my friend Martin for helping with things when I traveled around Australia. … my friend Honza for valuable discussions and books. … my friend Radka for assisting when needed. … Keith and Scott for fixing my Czenglish! … my very first colleague and couchsurfing friend Filip for shaping my mind. … to my former colleagues Barbora, Alena and Robert for their good work (all the best to you in your current jobs). And finally big thanks to all those who managed to read my very first blog article! I had the fortunate experience to go on your tour in Aug of 2011 and had a wonderful time. My ancestors come from the Czech Republic so it was great to be able to learn about the history of their home country. Even though I am back in Canada now, everytime I hear that someone is going to Prague I very enthusiastically recommend your tour. Thank you for all the wonderful memories. I remember those photographs in Facebook with the blue balloon. Congratulations on a wonderful blog post, fancy new website and your great team of guides (it was a pleasure to meet some of them last year). Well done Klara and your team!! Wishing you many happy travellers and all the best in the future!